Very good place in my opinion. Here I smoked the best indu-kush throughout the years. The flavour here is at its highest levels. The quality of weed is great. I tried different types of organic and no one failed! Unfortunately I never took hash here so I can't tell anything. Probably the reason is the incredibly Indu-kush flavour! Also the atmosphere is quiet and perfect to smoke such weed. Very Positive. Dim from Greece. Sent 13 Apr 2010. Friendly, comfy, sympathetic, good quality of weed and hash, reasonable prices. What else? DeathRowRecords from UK. Sent 13 Sep 2009. Spacious, modern, recently revamped decor. Exclusively locals other than us, but the friendliest guy we met behind the bar on our stay. We were invited to inspect everything on the weed menu (about 7/8 types) before buying, there was no hard sell and everything was amazing. We tried Amnesia Haze at 10E/g which was the most expensive but brilliant stuff, potent as hell. Sour Diesel at 17E for 2g was great as well, as was 3tje (15E for 2g) and the 6 Shooter (7E/g) was a very sweet tasting smoke too. Everything on the menu smelt great! Stays open late (around 1 or 2am), sports bar type of atmosphere, very friendly owner and young Oud Zuid locals; - a fantastic place, highly recommended. Epsilon from USA. Sent 4 Jul 2007. Dropped in a couple times in mid June 07. Their temporary location is on Daniel Staalstraat basically directly behind the original location. (though by the time this is read the original shop may have reopened) got the 3tje,and K2, both at 6 I believe, both good quality. Friendly, comfy, roomy, poolroom, fruit on the tables a nice touch. The staff says the renovated main shop to be re opened by mid July, and claims it will be stunning, look forward to hearing about that. But liked the location that we visited, hope both stay open. Rev from UK. Sent 20 Feb 2007. I discovered Club Media (just "Media" if you want to sound local!) at the end of a trip in December and bought a few strains "Skunk", "3TJE" and "Hippie". I don't remember a great deal about the first two, but Hippie was one of the best smokes of the trip. When I returned in February we stayed in an apartment near the Leidseplein square and Media was only a 15 minute walk away. The first time we went we bought 3.8g of Hippie for 23euros, and 3.4g of Dutch Punch for 23euros. All Media deals are pre-weighed, but they are always perfectly cured, never too dry. When we returned to Media the next day we again bought two 23euro deals of Hippie and DP, and also got some White Widow, I can't remember prices on that though. We stopped and had a smoke, it's currently at a temporary location but the place is really nice, sofas covered in cool newspaper print fabric, and a table in the middle with loads of fruit to eat. The budtender was friendly, gave us free papers, tips and drinks each time and was happy to talk about what was on offer. I'm almost loathe to recommend it too much so they don't start selling out of strains, but I would have to urge anyone in Amsterdam to go there, it's all organic weed aswell so it's my favourite shop now! Got lost in Adam (s+f) from Germany. Sent 9 Oct 2006. We found the old shop in the G. Doustraat. It's closed. At the door was the new address in "Ferdinand Bolstraat". We didn't find this shop although we searched a while. Because of hard rain, we went to Katsu which we already knew. The new "Club Media" must be somewhere around there! Courtjester from USA. Sent 15 Aug 2006. I can only support earlier reviews. We also smoked the Hindu Kush (3.8G/E23) and can vouch for its potency and mellowness. We also received the free packages of rolling papers and packaged tips, which was a wonderful bonus, as was the free fruit on the coffee table (we didn't actually eat any, but I liked the touch.) Details matter, and Media covered all the details. Fluff from USA. Sent 29 Jul 2006. 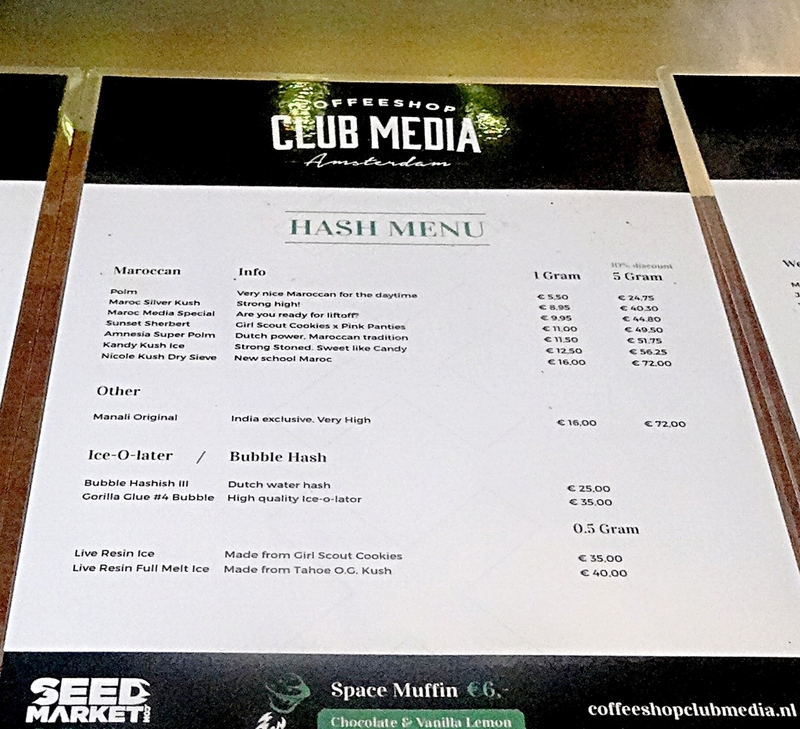 Club Media was an excellent place to buy some great organic hash and buds. The guy at the counter was very nice, but not too talkative. The buds tasted great and made me feel great. The shop moved around the block of it's original location, but it still is easy to find. Some nice restaurants in the area. Dan Kim from USA. Sent 23 Nov 2005. The best Hindu Kush I have ever tasted. After finding this coffee shop we didn't bother going anywhere else to get our ganja. I would go back to Amsterdam just for Club Media. AzLaker from USA. Visited 10/15. Sent 24 Oct 2005. Was closed due to remodelling, temp. location up the street. BigRu from UK. Sent 25 Mar 2005. Can't say enuff good things about this place. All the staff were friendly (bloody hard to find in the dam these days) giving free Rizla plus Media roach book with every purchase. Hindu Kush is their speciality and at 23euros for 4 grams, well worth the walk. Charles. Sent 21 Apr 2001. Media is owned by the sons of the guy that runs the Flying Dutchman Seed Co. A really cool shop with good prices and lots of strains you don't see at any other shops.